Until recently it was completely unknown, but now there is no doubt that the Salt Valley of Añana is one of the most spectacular and best-preserved salt works in the world. It was always there, in the province of Araba, just 30 kilometers from the capital Vitoria-Gasteiz, producing something as vital to the development of humanity as salt, the “white gold” of other times. It’s almost incomprehensible that a product so abundant and low-cost could have the importance it has had but is still now essential in many industrial processes and in human and animal nutrition. And if it is an essential product nowadays, it was even more so before the development of industrial cooling systems for preserving foods in good condition. Undoubtedly, it’s these circumstances that have enabled the Salt Valley to survive for almost 7,000 years, since the Neolithic period. 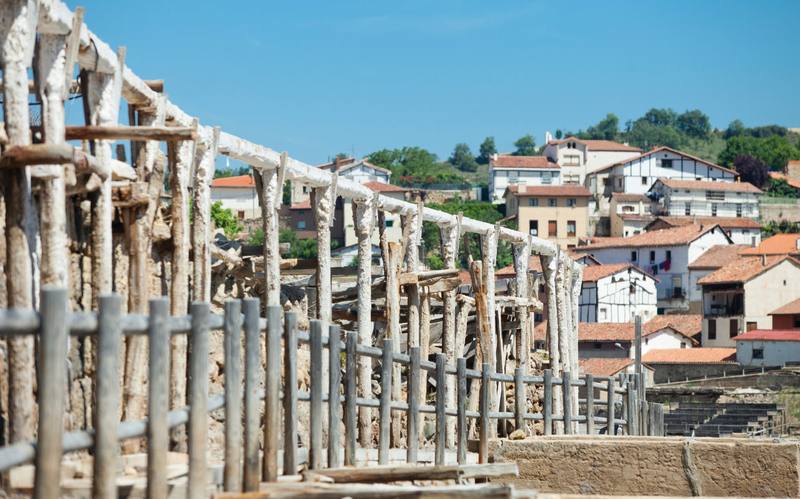 Over the years, a particular architecture has evolved through the construction of terraces made of stone, wood and clay. Besides, we must add its geological characteristics, its biodiversity, the landscape of the surrounding area… All of this makes the Salt Valley of Añana an extraordinary site, a gem comparable to Venice in the opinion of some of its visitors. In fact, the structure of the solar evaporation ponds, like the impressive Venice, is supported on wooden pillars which, after being saturated with salt water, harden and become indestructible. The water has a very high concentration of salt (210 grams per liter), almost as much as that of the Dead Sea, which extend into the terraces of between twelve and twenty square meters each for evaporation. The springs supply the brine at the surface level in a natural and continuous manner, which allows its use without the need for drilling or pumping. The salt water transportation is continual using gravity to move it through a network of channels. Production work is ongoing between May and September in the more than 800 pans currently in existence and the distribution of salt is carried out through a system of canals built by salt workers that total more than four kilometers. By means of several support systems, the adequate slope is maintained so that the brine flows to the different points of the salt pans. But nothing that we can contemplate today in Añana would have been possible without government collaboration and the salt producers themselves. Recovery work began a decade ago, and now it is really paying off. Andoni Erkiaga, Director of the Valley of Añana Foundation, has no doubt about it: “The Salt Valley attracts more than 80,000 visitors annually.” The importance from a social point of view is enormous, since Añana only has 156 inhabitants, one of the lowest populated municipalities in the Basque Country, and generates more than fifty direct and indirect jobs, it’s clear that its output is very important for the town. 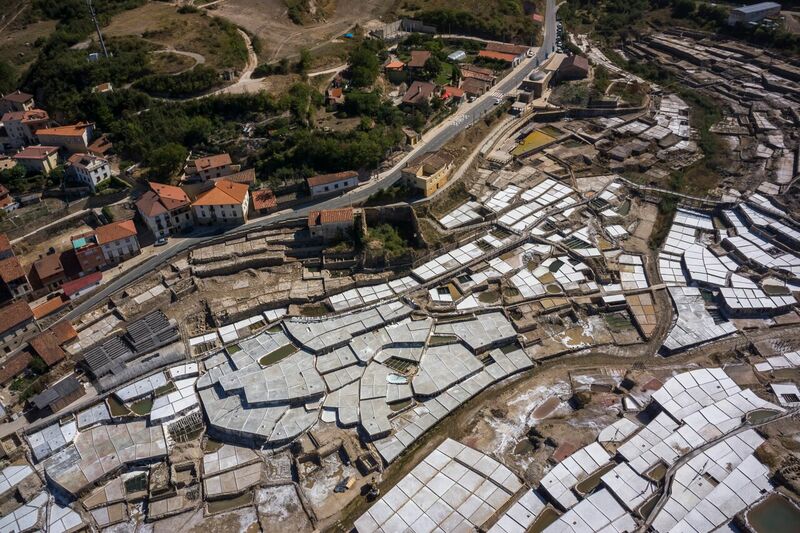 “The work carried out by the Foundation during these years has made the Salt Valley an international reference point, “an example of profitable recovery of architectural and environmental heritage” as shown by the Special Prize for Cultural Heritage, Europa Nostra 2015, and the recent recognition by FAO (Food and Agricultural Organization) as the first Important World Agricultural Heritage System (SIPAM). For the traveler who wants to get closer to explore about this wonder, there are three significant dates, although it can be appreciated any time of the year thanks to the guided tours that achieve its informative objectives. Still May, July and September are the most important dates of the salt calendar. In May, the beginning of the harvest is the first festivity of relevance. In July, the Salt Fair, where local men, women, children of the locale or relatives take on acting roles and perform a play about the 7,000 years of history with an impressive light and sound show, and in September the Festival of Entroje to reenact the end of the salt harvest. During this year, 2018, the Foundation hopes to continue taking steps and surpass the number of visits, already climbing each year, to increase the sale of salt and start collaborating with agri-food industries. For the slower part of the season with less visitors, virtual visits and a virtual reality application are planned to share the story of the 7,000 years of history in a comfortable indoor facility specially designed for this purpose. 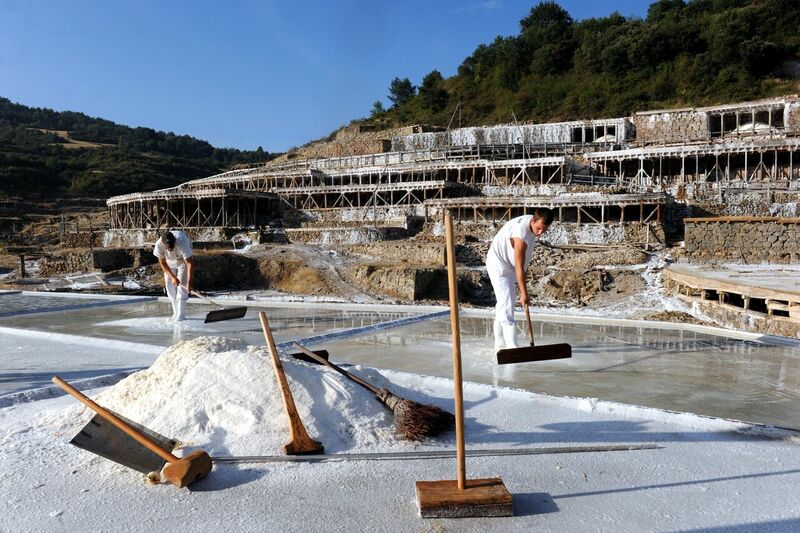 But there are still important challenges ahead such as “the sustainability of the salt works that were enjoyed in days gone by,” in the words of Erkiaga. For centuries all the natural resources have been used. But in some moments of history this has not been the case and the salt works have suffered. One of the worst moments was in the twentieth century with the mechanization of transportation and the improvement of production techniques in oceanic salt pans. The competition in the marketplace led the salt producers of Añana to apply non-environmentally friendly materials such as cement on old surfaces. This made eliminating these debris quite difficult. But now it’s time to recover the fullness of what it once was. Felix Iriarte is a journalist. Be the first to comment on "The Salt Valley, a Treasure in the Heart of the Basque Country"